Officer Eric Avendano and Reserve Officer Stephen Lee received the Preservation of Life Award at the Above and Beyond ceremony. Editor’s note: The Above and Beyond Awards ceremony was held on September 8 to present the Medal of Valor, the LAPD Purple Heart and, for the first time, the Preservation of Life Award. The new award was presented to 25 officers, including Reserve Officer Stephen Lee. The following article is reprinted with permission of the Los Angeles Police Foundation. 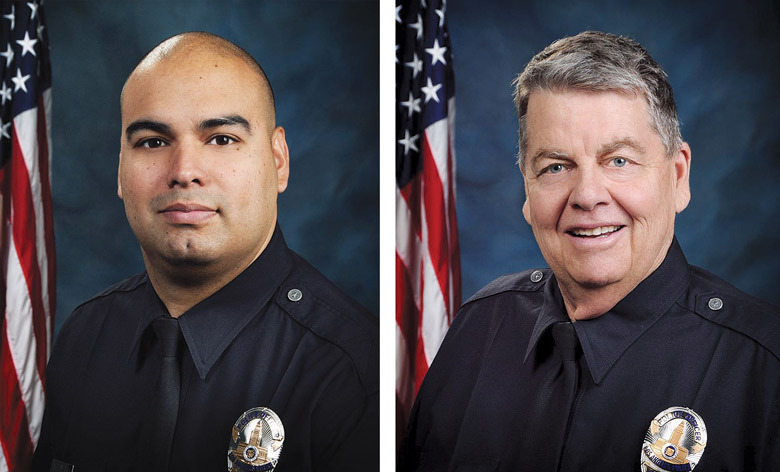 On February 20, 2015, LAPD North Hollywood Division Officer Eric Avendano and Reserve Officer Stephen Lee were conducting a traffic stop when they were flagged down by another motorist who had been involved in a traffic collision. The motorist told the officers that the other party drove into a nearby alley, so the officers finished their traffic stop and went to look for him. Unbeknownst to the officers, the fleeing motorist had armed himself with a tactical axe and was waiting just around the corner of the alley with the weapon raised over his head. As Avendano slowly moved toward the end of the alley, he saw the suspect with the axe. He immediately warned his partner, who would have been on the receiving end of a blow from the axe had he continued walking. Both officers immediately drew their weapons, and Avendano ordered the suspect to put the axe down while backing away and maintaining a visual. The suspect advanced toward him with the axe still raised over his head when Avendano repeated his command to drop the axe. Although the suspect did not drop the weapon, he lowered it and retreated. Avendano then engaged him in dialogue and tried to convince him to drop the axe. The suspect told the officer that someone was trying to kill him. It was then that the officer realized the suspect was either suffering from mental illness or under the influence of narcotics. Avendano continued speaking with the suspect and requested backup. While he continued speaking with the suspect, responding officers and a supervisor arrived on scene with a beanbag shotgun. The suspect was hit with three beanbag rounds, taken into custody and convicted of assault with a deadly weapon on a peace officer. In their encounter, the officers confronted a situation that could have resulted in the justified use of lethal force. However, both officers exhibited sound tactics and restraint that allowed for de-escalation of the situation and the use of less-than-lethal force. For distinguishing themselves by employing exceptional tactics and exercising sound judgment, beyond the normal demands of duty, to preserve the life of another during a volatile or dangerous encounter while protecting the safety and security of the public and his or her fellow officers, the Preservation of Life Medal is awarded to Officer Eric Avendano and Reserve Officer Stephen Lee.